Justin Randall Timberlake is an American singer, songwriter, actor and record producer. Born in Memphis, Tennessee, he appeared on the television shows Star Search and The All-New Mickey Mouse Club as a child. 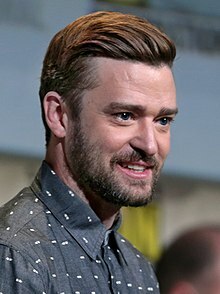 In the late 1990s, Timberlake rose to prominence as one of the two lead vocalists and youngest member of NSYNC, which eventually became one of the best-selling boy bands of all time. During their hiatus, Timberlake released his debut solo album, the R&B-focused Justified , which yielded the successful singles "Cry Me a River" and "Rock Your Body", and earned his first two Grammy Awards. Justin Randall Timberlake (born January 31, 1981) is an American singer, songwriter, actor and record producer. Born in Memphis, Tennessee, he appeared on the television shows Star Search and The All-New Mickey Mouse Club as a child. In the late 1990s, Timberlake rose to prominence as one of the two lead vocalists and youngest member of NSYNC, which eventually became one of the best-selling boy bands of all time. During their hiatus, Timberlake released his debut solo album, the R&B-focused Justified (2002), which yielded the successful singles "Cry Me a River" and "Rock Your Body", and earned his first two Grammy Awards. His critically acclaimed second album, FutureSex/LoveSounds (2006), characterized by its wide range of musical influences, debuted atop the US Billboard 200 and produced the Billboard Hot 100 number-one singles "SexyBack", "My Love", and "What Goes Around... Comes Around". With his first two albums exceeding sales of 10 million copies worldwide, he was established as one of the most commercially successful singers of the decade. He has also collaborated with other artists, including "Give It to Me" (with Timbaland) and "4 Minutes" (with Madonna). From 2008 through 2012, Timberlake focused on his acting career, effectively putting his music career on hiatus; he held starring roles in the films The Social Network, Bad Teacher, In Time, and Friends with Benefits. Timberlake resumed his music career in 2013 with his third and fourth albums The 20/20 Experience and The 20/20 Experience – 2 of 2, exploring neo soul styles with the song structures of 1960s and 1970s rock. The former became the best-selling album of the year in the US with the largest sales week, and spawned the top-three singles "Suit & Tie" and "Mirrors", while the latter produced the top-ten song "Not a Bad Thing". The eponymous concert tour for the albums originated the concert film Justin Timberlake + The Tennessee Kids, named after the accompanying band in his live performances. In 2016, Timberlake voiced the lead character in DreamWorks Animation's Trolls, which soundtrack includes his fifth Billboard Hot 100 chart-topping single, "Can't Stop the Feeling!". Timberlake's work has earned him numerous awards and accolades, including nine Grammy Awards, three Brit Awards, seven Billboard Music Awards, and four Emmy Awards, the latter being for his appearances on Saturday Night Live. Time named him one of the 100 most influential people in the world in 2007 and 2013. His other ventures include record label Tennman Records, fashion label William Rast, and the restaurants Destino and Southern Hospitality.